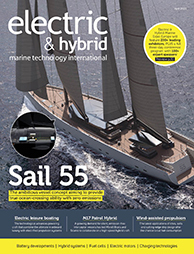 Electric & Hybrid Marine World Expo Conference 2019, which is an integral part of Electric & Hybrid Marine World Expo in Amsterdam, the Netherlands, from 25 - 27 June, is the world’s only international conference exclusively dedicated to electric and hybrid marine propulsion systems, technologies and components. More than 40 of the world’s leading experts will present technical papers on latest and next-generation technology that will power ships of the future. With significant reductions in emissions and fuel costs, lower maintenance costs, reduced vibration levels, less noise, and a host of other benefits for the global marine industry, Electric & Hybrid Marine World Expo Conference is a must-attend event for ship owners, ship builders, naval architects and ship designers, technology manufacturers, propulsion designers and engineers, and anyone in the marine and offshore industry interested in the wide range of benefits provided by increased electrification.